MITRE engineers and University of Virginia clinicians are developing a field-testing laboratory and analytic tools to help military medical providers make better decisions under the stress of extreme environments. Under the best of conditions, helping an injured person is stressful. Just consider the added pressure of making life-and-death decisions in the extreme environments that military medics, corpsmen, or technicians face—or the kind civilian first responders encounter. A MITRE sponsor expressed interest in ways in which cognitive analytics and biosensors could help field medical providers make better decisions on the battlefield or in other extreme scenarios. Our researchers wanted to identify how stressors such as exertion, noise, and an impending threat might affect their performance and decision making. Understanding these factors, as well as testing and improving biosensors and cognitive analytics software, are important steps toward providing better decision support tools for warfighters, first responders, and others. With a grant from MITRE’s internal research program, the MITRE@UVA partnership and site leader Cj Rieser, PhD, collaborated with the University of Virginia (UVA) to take on this challenge. The team consisted of several MITRE@UVA affiliated full-time staff and interns, as well as UVA clinician J. Forrest Calland, M.D., and graduate medical student researcher Michelle Lynch. The MITRE@UVA team started by evaluating Food and Drug Administration-approved, military-grade sensors for their use in extreme physical environments. Following Institutional Review Board (IRB) approval, they tested sensors by monitoring volunteers as they traversed a Virginia Tough Mudder, a multi-mile obstacle course with water and height obstacles. While the event had realistic scenarios, there were too many variables, and it left unresolved several important questions. The research team decided a more controlled exercise made sense. They began working on what would become the "IRONMITRE" studies. Needing additional expertise, Rieser recruited Don Gagliano, M.D., the retired special operations commander of all medical forces for Operation Iraqi Freedom. Gagliano designed scenarios that stress the participants safely while monitoring cognitive capability at peak performance and exertion. 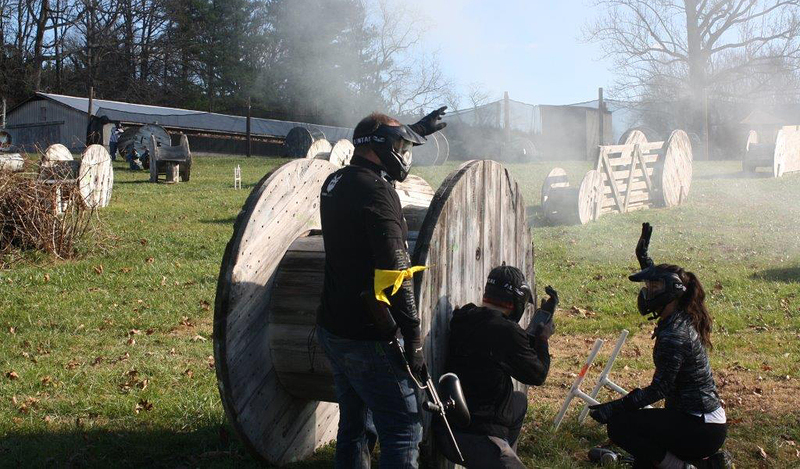 In July 2016, MITRE conducted the first IRONMITRE, an IRB-approved human study at a paintball course south of UVA. During the two-day event, a "rescue squad" navigated the field, avoiding and removing obstacles to complete their objective. Meanwhile, the "opposing squad" created stress using paintball, smoke, and other hazards. The rescue squad members wore chest biosensors that recorded and streamed their heart rate characteristics, respiratory rate, temperature, and position. Additionally, they wore a smart watch that provided GPS location to a visualization website. Via paper tests, participants shared their subjective experience by answering questions such as, "What are you feeling now? Do you trust your squad leader's decisions?" To track the information, the investigative team used a commercially available application and a proprietary network. While the application successfully provided vital signs, they were not integrated with the cognitive state of the participants, thus the team needed more complete information. They decided to develop new software with advanced analytics capabilities. Carrying a "wounded" warfighter during IRONMITRE2. Additional MITRE engineers joined the project to increase the intensity of the challenge and develop a more effective application for data recording, analysis, and correlation. This team designed MITRE's clinical analytic remote evaluation platform (MITRE CARE). It’s an integrated mobile/web platform that provides real-time cognitive assistance based on analysis of live data collected from wearable medical devices and environmental sensors. IRONMITRE 2 took place In December 2016 and included participants with military experience. In addition to physiologic monitors, participants wore wrist phones and video cameras for communication, psychological monitoring, and live GPS tracking. The new experiment involved higher stakes. Among other things, the rescue squad now needed to avoid snipers and simulated biohazards to find and provide medical intervention on a mock patient. The CARE platform allowed the researchers to analyze data in real time. A joint analysis team of MITRE mathematicians and UVA clinicians monitored the participants and identified any unique findings. "With the application, we can see where participants took twice as long to make decisions than average," Rieser says. "It's an integrative system, where we can correlate numerous physiological data with behavior." MITRE created a proof-of-concept algorithm that provided a live analysis of incoming heart rate characteristics to derive the participant's experience. Lynch is optimistic at the progress: "As we look ahead toward future events, we hope to incorporate cognitive information and voice characteristics to better determine a provider’s state of mind and provide appropriate support." As IRONMITRE 2 occurred, members of the Army's Nett Warrior Program viewed a live video feed. They mentioned that there might be opportunities to bring the MITRE CARE platform on the road to military medical science and technology exercises around the country. In the long term, the MITRE/UVA team is working toward expanding the MITRE CARE platform by creating decision support tools for warfighters, veterans, and first responders. This system could allow a remote commander to provide guidance if a squad leader’s decision making is impaired. And if communications with command are severed, the system can provide recommendations autonomously. "Those possibilities are all ahead," Rieser says. "But with the IRONMITRE studies and the MITRE CARE platform, we've already demonstrated that it's possible to create an integrated view of a care providers' cognitive state, physiology, and pattern of behavior. And that's an important step toward bringing more warfighters home safely." Applying existing MITRE innovations, UVA is developing a clinical field medicine event called the "IRONMASH." A spin-off of previous IRONMITRE exercises, it will investigate the utility of providing varying levels of decision support in real-time field casualty scenarios. This is significant because, as Gagliano says, "Safe evacuation may not always be possible, and complex care may need to be provided in remote locations." While this research focuses on healthcare and decision support, the knowledge and tools gained will have widespread usefulness for other MITRE sponsor activities and health system innovations. MITRE and UVA affiliates are looking forward to their continued partnership.